The 101st annual Newport Beach Christmas Boat Parade began Wednesday. It goes on every night in Newport Harbor (from 6:30 to 9PM) 'til Sunday, which is the grand finale. Saturday will probably see max crowds. We went last night (Thursday) and the island was hoppin'. Electric. Some years the weather is freezing (by Southern California standards), being on the water, but last night it was downright balmy. We saw at least two brass bands, complete with tuba, playing your favorite Christmas songs. Of course we had to get some hot buttered popcorn, and after that, a light-saber from a sidewalk vendor, who pushed a dazzling cart surrounded by eager kids. What a great time we had. If you read The Golden Orange (by ex-LAPD detective Joseph Wambaugh), you know the novel/story begins with the Newport Beach Christmas Boat Parade. Parking is the worst part of the boat parade. It's a mad-house. The cops block off many streets that normally provide access to the island. We took the bus down, as did many others, rather than fight traffic. So the bus ride was like a big rolling party-on-wheels down to the boat parade. 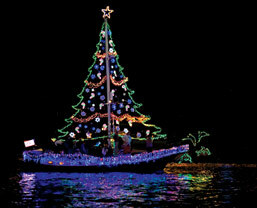 Listed below are links to blogs that reference this entry: Newport Harbor Christmas Boat Parade. This page contains a single entry by Rad published on December 18, 2009 6:11 PM. The White House (Gasp!) Goes Drupal was the previous entry in this blog. Winter Solstice = Longest Night (& Heffalumps) is the next entry in this blog.